Home→Uncategorised→Ottawa Small Press Book Fair 24 Nov. 2018. 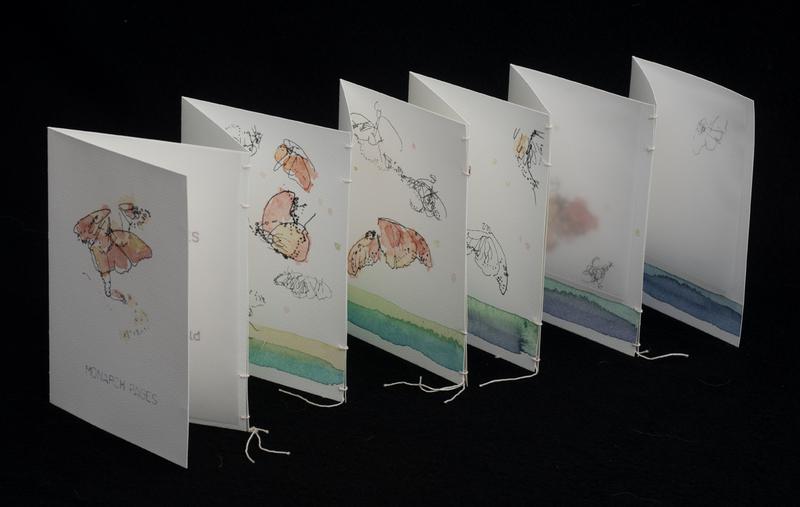 Monarch Pages Artist Book, 7 x 5 inches closed. Photo credit David Barbour. Saturday, November 24, noon to 5 pm. Jack Purcell Community Centre, 320 Jack Purcell Lane, Ottawa, Ontario. Visit the Fair to see Monarch Pages, a self-published artist book. This accordion-style book expresses a deep concern for the increasing loss of monarch butterfly habitats throughout Canada and the USA. The blind-contour drawings are done by looking at the specimen but not at the hand that draws. This technique reflects the precarious situation of the monarch. The butterflies appear to be barely holding together, fragile, yet clinging to life. Each page represents a habitat and is loosely connected to the next by threads that might easily come apart. Metaphorically, the poetic text asks how many pages can be lost before the unique cycle of the monarch migration is broken? Also for sale will be original artist cards suitable for framing.